Vibrant restaurant and bar el cantara has opened to bring a Spanish/Moroccan influenced dining experience to the heart of Soho. With a surfeit of European, Oriental and Indian restaurants in the surrounding area, its unique proposition is certainly a welcome addition. Considerable investment has gone into providing an authentic experience, with el cantara’s owners having scoured the markets of Andalucía and North Africa for the huge array of artefacts that bring the building to life. Even details such as cushions and soap have been sourced from Morocco. To finish off the look, intricate metalwork lanterns cast an atmospheric light throughout the venue. Adding to the Mediterranean feel is a charming outdoor terrace (complete with heaters during the winter), which provides a laid back setting for a few pre/post meal drinks or spot of shisha smoking. There is also an equally alluring indoor bar for those who don’t fancy braving the cold. To complete the authentic experience, visitors to el cantara are also treated to traditional entertainment in the form of exotic belly dancers who perform nightly. The attention to detail crosses over into el cantara’s culinary offering. The menu comprises a comprehensive range of Moroccan and Spanish classics, all presided over Head Chef Noureddine Khouyi, who made his name at the legendary Mamounia in Marrakech. There is a large emphasis on sharing dishes, with a large appetiser section offering dishes such as Patatas Bravas, Soujouk (spicy sausage in a tomato sauce) and Gambas al Ajillo (king prawns in a spicy garlic sauce). 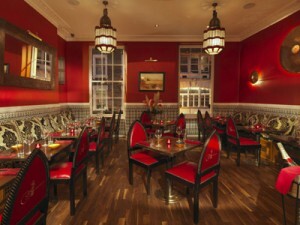 Main dishes see North African classics such as Beef Tagine sit alongside seafood Paella and grilled meats. The food is cooked to a high standard and is enjoyable enough. However, you do get the feeling that the kitchen is holding back on the full flavour at times – perhaps because they don’t feel Soho is ready for the adventurous tastes of the real deal.